This CD/MP3 is Platinum Accredited (100 000+ copies) & has helped people conquer their weight loss goals fast, easily, & automatically using hypnosis! Welcome to the new, slim you! Successful and permanent weight loss is the result of changing your lifestyle and decision making processes – not by a temporary ‘fad’ diet. You can’t eat processed food, fast food, and frozen meals for the rest of your life! Sure you might lose some weight for a while but what happens after you return to your old habits? This CD was awarded a Platinum ARIA Record for selling over 100 000 copies! Experience the positive and beneficial suggestions on this CD or MP3 time and time again in the privacy and comfort of your own home. Experience greater clarity, focus and motivation to achieve your weight loss goals now and in the future! If you want to lose weight with hypnosis you simply cannot go past this program. It is time-tested and proven to work and is one of the best selling weight loss hypnosis CDs ever produced by any author in any country. 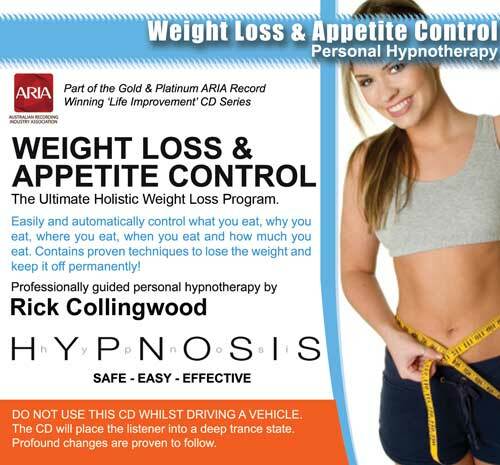 About two years ago I ordered Rick Collingwood's CD, Weight Loss and Appetite Control. I heard him on the radio show Coast to Coast AM. I was in my 50s, 5'3", and weighed 177 lbs. I had tried and tried to lose weight for years after I had my son 25 years ago, and nothing worked. I was fat, fatigued, depressed, and desperate. I had prayed to God for help. I had no idea that the answer to my prayer would be a hypnotic CD from Australia. I was also skeptical and suspicious of hypnotism. But I listened to it consistently and the weight starting coming off slowly but surely. My outlook on life became more positive and I started feeling happier. I was also listening to Rick's CD on Motivation and Action. My environment began to reflect the positive changes in me. I started painting and brightening up my house. My kids even noticed it when they came to visit. I am 55 years old now, I weigh 134 lbs., and I can run 6 miles. I have been listening to other hypnotic CDs as well by Giovanni Lordi and Jan Duncan. I have found them all to be very relaxing, healing, and edifying. I am amazed at the power of the subconscious mind and at the power and effectiveness of hypnosis. I want to thank all of you at Mind Motivations for sharing your knowledge and skills and making it so affordable as well. You are my hero! After listening to you on Coast to Coast I purchased your Weight Loss MP3 and have been amazed of the results. In 2 months I have lost 20 pounds and feel in total control with no worries about what I eat. After listening to your radio interview I found I am a good subject for all this because from the beginning I go into trance with out a hitch, with in a moment of hearing your voice I'm out! The weight loss worked so well I have purchased 2 other MP3 programs and downloaded the free motivation program. My question is, if I set up my computer to play these during my sleep, will it cause any issues? I'm very happy and feel like it's been such a help in my mental health I want to fix everything at once, i.e. weight loss, becoming a non-smoker, stop procrastinating, self healing and on and on. And by the way, I have used the other programs on the internet to compare, but yours is without a doubt the best! I just wish I knew more about how much hypnosis I can take at one time. Personally I think I can handle more than one focus at a time but want to make sure. Thank you for your time and for saving my life not just on a physical level but also a spiritual level as well. You are truly an angel! I happen to see the ABC news show Tuesday night (here in the US).. Prime Time: Secrets of Your Mind series. This show featured a story about a woman who was obese and had to lose weight (or else ! ), so surgeons cracked open her skull, probed into her brain and stimulated the hypothalamus triggering a feeling of fullness or not being hungry. -- While she was wide awake! You can watch some of it at the link below, but my thought was "How unfortunate that she did not have the benefit of you instead." All through this piece I could easily draw stunning parallels between the doctors tinkering directly with this brain vs. your powerful, yet safe suggestions into the subconscious for weight loss. I feel that my experience through you is even more dramatic actually. I am not sure your opinion on this cutting edge (pun intended) method for brain manipulation. I have not heard about such a thing and knowing of your interest in things of the mind and your splendid talent for hypnosis, I thought to let you write you. So here is a way to see part of it if you want: http://abcnews.go.com/Nightline/Prime/ or if you need to go to www.abc.go.com to look at the yesterday's shows and view "Secrets of Your Mind"
And by the way, I have been continually losing every week, little by little since using your tape for weight loss...and that is good, I am not in a hurry and losing seems so effortless. About 20 weeks, 20 pounds; 30 to go! Just to let you know I first purchased the Weightloss and Apetite CD about 3 weeks ago and am on the last stage of the program as instructed. My mind has not felt better, lighter, stronger and somehow happier in a very very long time. In a matter of 2 weeks I joint the gym, do 2-3 indoor cycling classes a week, walk around my local park regularly, I have that ' lift' in my step that just makes me want to do things. For the first time in my life I began to understand what it is like for those people who are not effected by emotional eating and who do not feel the need to use food to cope with life and with themselves. For so long I have been riding this wave of dieting, trying to be lighter, to feel happier and not to be burdened by my mind, only to have some tiny moments of success...until the next wave of emotional downfall & medicating myself with food. I now know daily life that does not focus on snacks and comfort-food and I no longer feel like I NEED them just to get that 'ok' feeling. My daily nutrition is based on three meals that are smaller in quantity and my eyes and my mind crave wholesome food. I don't regulate it, it just happens. I now can differentiate that feeling of 'light stomach' and enjoy the feeling of a slight 'hunger'. I have so far lost about 2.5 kg in the two weeks since I started the program and that is just a bonus to the other benefits I've been feeling. I love the fact that I can now visualise myslef as a trim, healthy, happy and smiley woman...something I wanted but could not really see happening before. I hope I am not too quick to speak of such lovely benefits and trust that even more is to come. Please pass this onto Mr Rick Collingwood on my behalf. I don’t know if this is the correct place to send such a comment as I wish to praise Mr Collingwood on his great product. Six weeks ago I was feeling unwell, I thought i had a UTI but after tests the Dr told me that I had no UTI but extremely high blood sugar and was on the verge of Type II Diabetes. Although I am overweight I had no idea that it was this bad. I was told that I had to do something about my weight NOW rather than yesterday. I decided to go a pretty harsh weight loss program as we recommended by my Dr but I also wanted to stop my bad eating problems from within. I have a huge problem with sweets and constantly crave sugar (as was evident by the high blood sugar). I decided to try the weight loss cd. I actually laughed at myself for even considering it because 6 weeks ago hypnotherapy to me was a bit of a joke really. But…I knew that i had to do something from within. Within six days of using the cd I came to the stark conclusion that for the last three days I had not eaten anything that I shouldn’t and more to the point I never even thought about it. Surely I thought this was just a coincidence but sure enough nearly three weeks on and I now have absolutely no desire to eat anything bad and seeing as it’s Easter time and I am surrounded by chocolate I have eaten NOTHING. I have also started looking at myself in a new life, I actually love the fact that I have lost a fair bit of weight (from my weight loss program also) and am so pleased with myself. I enjoy feeling like I have beaten this bad habit that would have killed me eventually. I can not thank Mr Collingwood enough for sharing his wonderful cd with me and I know that I am making right choices now not only for me but for my family. I went shopping yesterday and instead of filling my trolley with a few more junk things than I should (as I usually do) the thought didn’t even cross my mind to put them in my trolley and instead it was filled with much more healthier and fresh foods. My husband says that Rick Collingwood should be the luckiest man in the world knowing that he is going to bed with thousands of women every night. Please excuse the delay it getting this to you. Not like me but since we spoke life has been very hectic to say the least. We discussed my writing a testimonial with regard to my successful weight loss using Rick’s CD. The light joke is that he is the only man I have been on my bed with in a very long time. (No offence intended). That’s because I lie on top of the bed and use the earphones. I find this the most relaxing position. The history is that before Christmas I lost two kilos then started using the CD and have subsequently lost several more. I have gone from a size 18 down to 14 and have recently tried a size 12 in long pants but notquite ready to introduce that size into my wardrobe permanently just yet,The best thing about the CD is that it restructures my way of thinking and eating habits. I seem to be more conscious when I go shopping. I am also aware of why 1 eat certain ‘unhealthy’ foods. These seem to be connected with comfort eating due to loneliness, and mood swings. What the CD does is assists me to ‘care for me’ rather than ‘not care for me’. 1 initial used the program in its entirety as instructed which is a discipline in itself but I was determined. I now use it on a regular basis as old habits die hard; so having the CD handy for moments of encouragement helps me stay on track. I drink more water more often and walk a lot more. I don’t drive and walk every where most of the time but I am choosing to walk home more regularly from town rather than catch the cat bus. Any snacks I do have are nuts and dried fruits but not often. Meals are half the amount. I recommended the CD to my sister who lives in Victoria and she is using it with good results. We both have Thyroid conditions which can make losing weight difficult but the CD seems to work for us. Take care and I look forward to seeing you again sometime. Personally I’ve lost nearly 10 kgs and feel wonderful. I have shared your CDs with my partner and friends, and they too are enjoying the benefits in various areas…eg., Stress Management; Self Esteem; and Abundance!